Marv Merchants played by Daniel Stern in "Home Alone"
While out walking, a crab finds a rice ball. A sly monkey persuades the crab to trade the rice ball for a persimmon seed. The crab is at first upset, but when she plants and tends the seed a tree grows that supplies abundant fruit. The monkey agrees to climb the tree to pick the fruit for the crab, but gorges himself on the fruit rather than sharing it with the crab. When the crab protests, the monkey hurls hard, unripe fruit at her. The shock of being attacked causes the crab to give birth just before she dies. Why is this picture on my furikake jar? Why is there a talking cow pie in this story? is the moral `don’t bully.’ or is it `if you murder the you must spare nobody, even the children of your victim.‘? 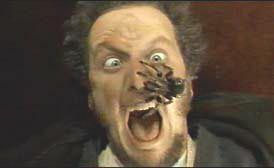 did this story serve as inspiration for the character Marv Merchants from Home Alone 1 and 2? … this is too easy, i will stop. So I think I can safely assume this was a protest against nuclear power. Thought #3 : Why has the sky not fallen yet? Another friend of mine told me that the land value of the Imperial palace was greater than the land value of all of California at the peak of the Japanese economic bubble which popped in the early 90s. I used to think the sky was falling due to how much we think our country (America) is worth. But this factoid makes me think that things could be worse. This is really a continuation of #3 but the opposite. I’m no accountant (nor a Republican). However, this site says our debt is 14.3 trillion (which totals 46k per citizen). I really don’t understand money, and I don’t understand how we still exist. A while back I did a post on fiat currency and fiat love. I’m seriously afraid the emperor has no clothes and it’s just people with really strong denial that are holding things together. Of course, my bet is the problem will be solved by printing more money, which feels really weird, since we are solving a problem by photocopying stuff. How are we still here?